Okay so I haven’t blogged in a really long time – don’t be mad at me. BUT, I did do something really fun last weekend that I wanted to share. 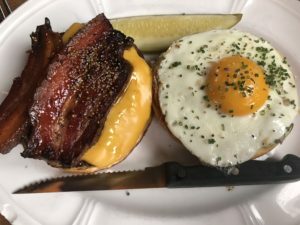 I took a quick trip to Chicago and got to try what has been hailed, “one of the best burgers in America”. 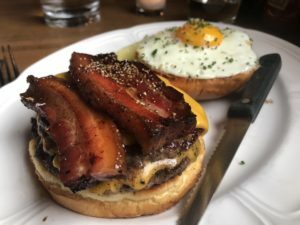 I’ll write about all the other food I ate in a separate blog post, but this is solely dedicated to “the burger”. 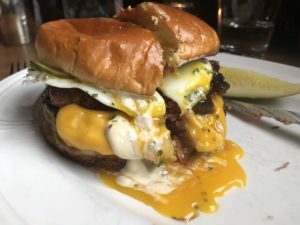 I arrived in Chicago with Au Cheval, opened in 2012 and located in Chicago’s West Loop, being one of the most recommended spots that I had to check out. I had been warned that the wait would be long – at least 3 hours. I knew that I would have to eat at this restaurant, so we hatched up a plan. 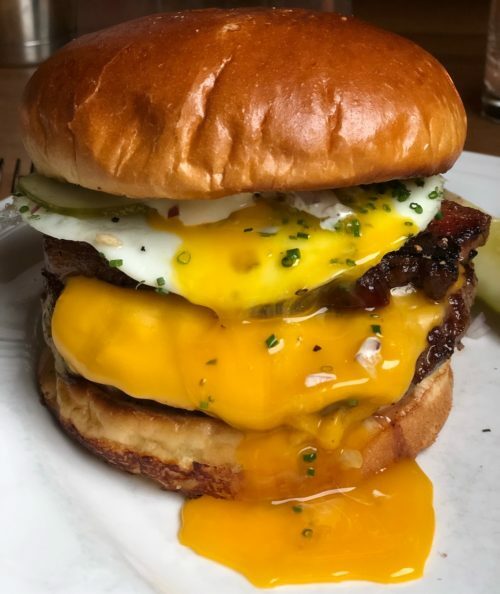 If you want to eat at Au Cheval, I suggest that you do as we did and head to the West Loop area around 3pm, put your name down on the waitlist and you’ll be seated at around 6 pm just in time for dinner. While you’re killing time, there’s a lot of great places in the area for snacks or drinks (Sawada Coffee, BomboBar, Do-Rite Donuts, Bar Siena). I mean come on with that thick bacon?! I actually ended up asking the waitress if there was a mistake because I had only ordered a single patty and two ended up on my plate. She said that because the patties are thin, they put two for the single order and three for the double. When I assembled the burger and cracked the yolk, this burger was probably the prettiest damn thing I’d even seen. I mean have you seen anything prettier? Now for what you’re all waiting for, is it really “one of the best burgers in America”? Final verdict: YES. This burger is the real deal. It’s juicy, tasty and perfectly seasoned but on top of that the add-ons (being the bacon and egg) are the perfect compliment to this meal. If you’re ever in Chicago I say you do need to have this burger, but be prepared for the wait. Also, if you can’t exactly afford a trip to Chicago and you live in the NYC area, you’re in luck!! Au Cheval is opening a location in Tribeca in late 2018. Get your stomachs and wallets ready to try one of the best burgers in America.